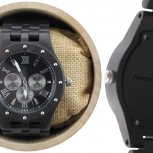 This striking Ebony Men's Watch with complementary ebony dial is very impressive. With a rugged sense of style, the all-black watch will get you the attention you deserve. Featuring an ebony dial with minimalistic black markers, less is definitely more when it comes to this fabulous design from Angie Wood Creations. The ebony men's watch with its black leather strap manages to capture the nature-inspired trend effectively. The leather strap features a buckle clasp and can be adjusted to suit your movements and mood. Its streamlined design and dark tones will charm the socks off anyone in its path. ALL-BLACK TREND: The all-black watch trend offers a sense of understated luxury and style. 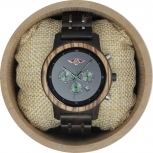 Effortlessly cool and always charming, the Ebony Men's Watch from Angie Wood Creations is an iconic accessory. On-trend, yet seemingly retro, this watch is ideal for those who like to make their mark and leave a lasting impression. 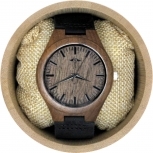 EBONY WOOD: Ebony wood makes a fine choice for a quality, timeless men's fashion watch. 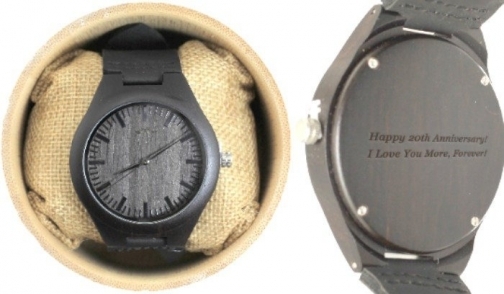 Unlike other black fashion accessories, this watch is far from one-dimensional and dull. 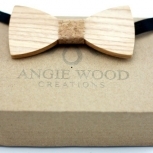 The black-on-black look with the contrast of leather and wood, makes an exciting and premium fashion choice that our customers come to expect from Angie Wood Creations. 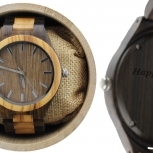 GENUINE LEATHER STRAP: This handcrafted ebony watch features our signature genuine, quality leather bracelet. 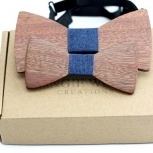 It measures 23mm and has a silver buckle which ties in beautifully with the silver crown. Fully adjustable and ever so soft to the touch, this genuine leather strap embraces an old-fashioned sense of class and style.